Our first snow finally showed up! I made the first footprints down the sidewalk on an early morning rainy and snowy run. The roads were slick and slushy but it was a refreshing change of season. I like snow in November and am quite sick of it by March. Christmas lights are here and there around town and I'm definitely listening to Christmas music every day. Our lights and mini tree are going up this week, too! Our snow was gone. The happy little snowman is now a lonely single snowball surrounded by green grass. I ate too many slices of pumpkin pie but 'tis the season. I snuck in a few run and yoga sessions this week as keeping a routine helps to work through the holiday season. Winter has been oddly warm so far but I'm still dreaming of a white Christmas. The snow and ice will arrive soon enough and then it will be time to break out the ice skates! E said he is going to play hockey by himself this year. 11/21 MON: (Treadmill) 4 mi, 00:34 @ 08:24 pace. 11/23 WED: 5.01 mi, 00:43 @ 08:33 pace. I increased my pace between light posts but kept it relatively easy. Too icy for speedwork outside! 11/25 FRI: 5.17 mi, 00:46 @ 08:48 pace. My sister-in-law and I "ran off" some of the Thanksgiving treats and enjoyed our visiting time :) We are both quality time people and that run and a coffee date later that day were the best! Did you run a "Turkey Trot" race this week? What was a highlight of your Thanksgiving? 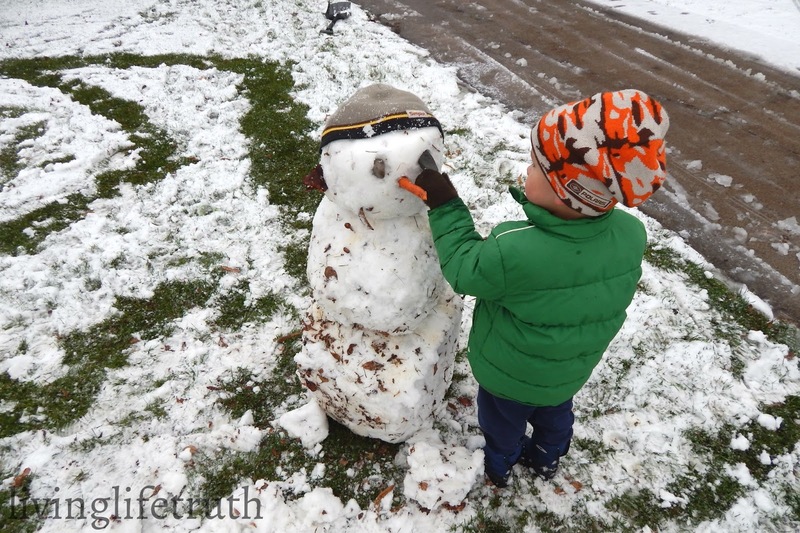 Parts of Minnesota were nailed by snow last Friday (2 feet in some areas!) but we ended up with nothing. Not even an inch! I'm thankful we missed the big stuff and didn't lose power — I feel for those who are still without — but secretly I am excited for our first snow of the winter. Looks like it's coming tonight and just in time for Thanksgiving. A non-training routine has formed in my running/cross training and finding a rhythm again feels awesome. That first month after the marathons made me feel like a chicken with my head cut off. Do I want to workout (Um, no)? How far should I run? What pace? An easy run again? AHHH Where is the training plan?! Transitioning from the training plan to "free running" feels awkward. It's a process. The plan is laid back with enough structure to motivate me. If I said I didn't have the urge to run another marathon in the Spring, I would be lying. That 3:15 is calling my name but it will take time and higher mileage than my past 40-mile training weeks to get there. My gut feeling says that now's not the time. For everything there is a season, as Solomon writes in Ecclesiastes 3:1. While I'm sure he wasn't talking about running, there are seasons when you are able to do less and when you are able to do more. 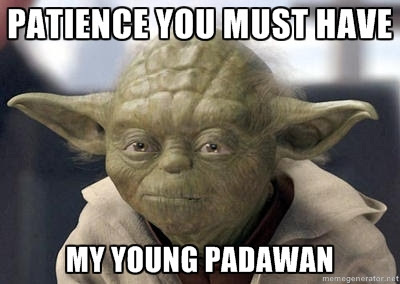 Patience, indeed! As I count my blessings this week, these two Yoda-sized people are at the top of my list. I am ecstatic for this "short" week, upcoming time with family and hopefully a large portion of pumpkin pie. May you have a wonderful Thanksgiving with lots of family, friends, and food! 11/14 MON: (Treadmill) 5 mi, 00:40 @ 08:00 pace. 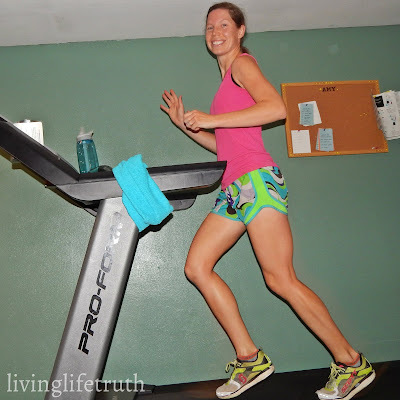 As weird as it sounds, I have really been enjoying the treadmill lately! 11/15 TUES: Runner's Yoga (25:28) while the kids napped AT THE SAME TIME. It was a miracle! 11/16 WED: (Treadmill) 3.61 mi, 00:30 @ 08:19 pace. Speed and hill intervals of 400m with 400m jog after. I plan to work in one low mileage speed or hill session each week now. 11/19 SAT: 8 mi, 01:02 @ 07:42 pace. What goal are you chasing these days? 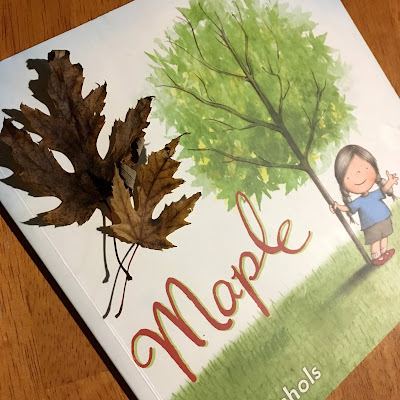 We were on the hunt for Maple leaves and their helicopter seeds (or "samaras") for this week's Outdoor Hour Challenge. Maple by Lori Nichols was our book of the week. 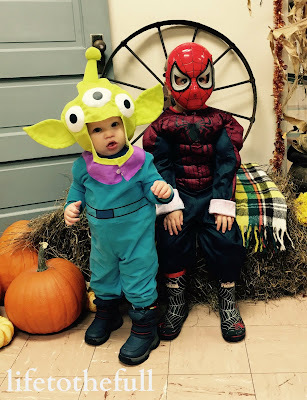 This is one of our favorites about a little girl named Maple and her baby sister, Willow. When we went out on another walk last week to check our leaves, the soft and colorful leaves are now mostly brown and very crunchy. And it was quite cold and windy! Finally it feels like November. We had a great time searching for these leafy treasures and will be on the lookout for Oaks and Acorns in the upcoming week. 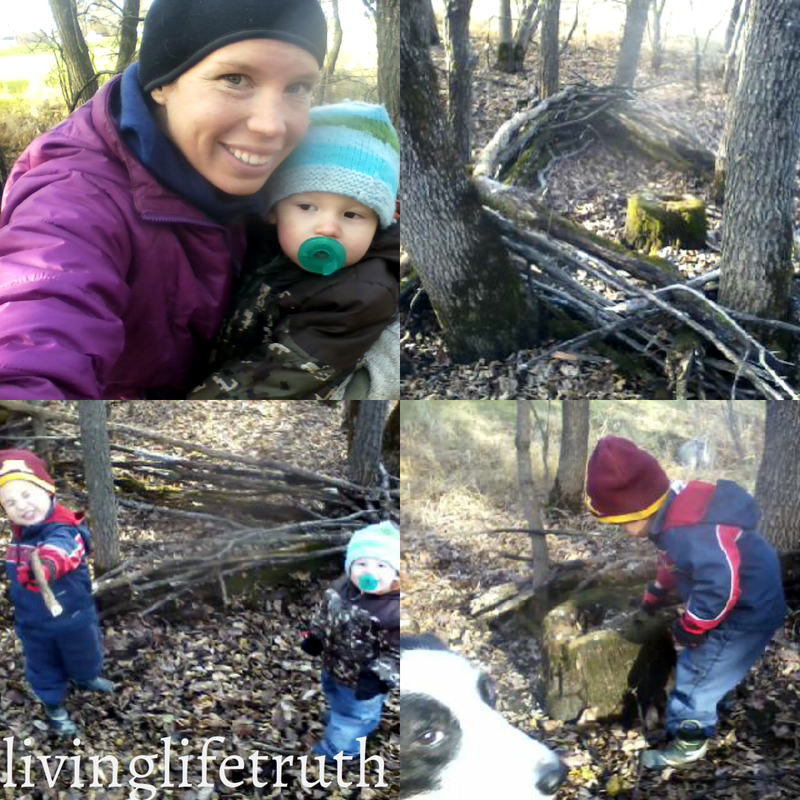 The kids love going "hunting" for the perfect leaves! 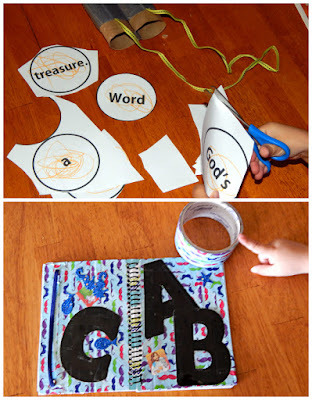 Learning the alphabet letters and sounds is right up our alley in this almost-four-year-old stage. E loves this book's "game show" style and asks to read this book many times a day. The sentences are indeed silly and the accompanying pictures prove to be entertaining. This is a board book which is great when you have little siblings around trying to destroy everything. 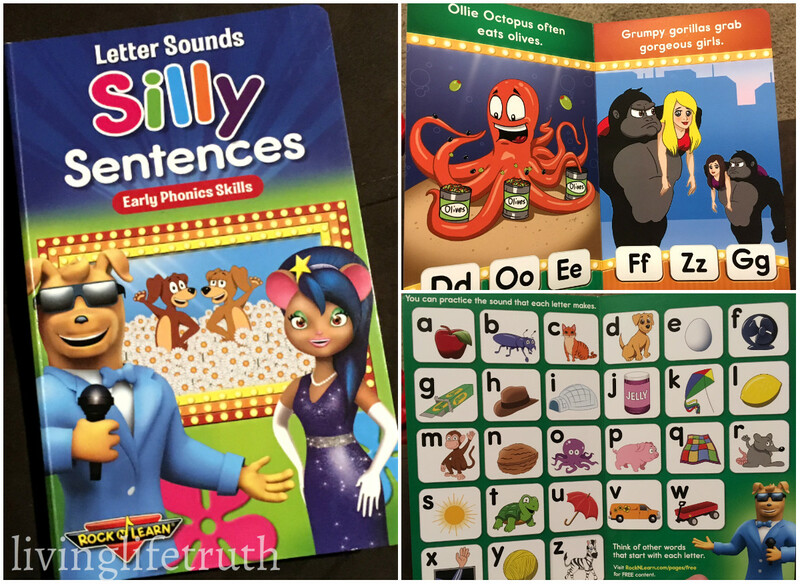 Along with the Letter Sounds Silly Sentences board book, Rock N' Learn has many other resources from Pre-K to 5th Grade & Up. I haven't checked out their DVDs yet but I would be interested in exploring their "Learn a Language" resources. The website also has some printable freebies. 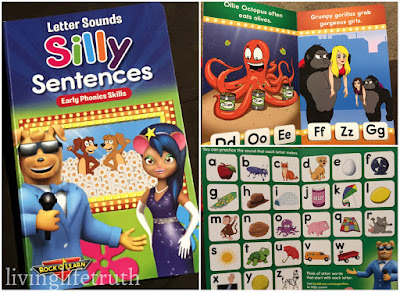 Rock N' Learn's Letter Sounds Silly Sentences board book is a great resource for developing pre-literacy skills. We give it a thumbs up. The kids and I tested out Volumes 1,2 and 4 of Heidi Songs' Sing & Spell Animated DVDs. Through singing, simple movements and repetition, these songs are designed to help children memorize the words and jumpstart their reading and writing skills. Volume Two: red, orange, yellow, green, blue, purple, brown, black, white, gray, pink, an, at, big, do, down, has, in, it, no/yes, not, small, this, too, up, we, what, who. Volume Four: A (word), all, am, as, be, by, came, dear, did, friend, from, good, had, his, I (word), if, love, made, nice, now, out, over, put, some, then, very, will, and your. E and even W were enthralled by all the action on the screen but they preferred to just watch rather than imitate the motions for each song. I thought the Sing & Spell DVDs were very busy, certainly repetitious - and quite annoying. They were fine to review but I would not buy them myself. This was one of my favorite Dr. Seuss' books as a kid and I still love reading Dr. Seuss to my kids. As I mentioned in my review of The Lorax app, I am not a fan of putting cell phones or iPads in front of my children. Children enjoy working through this interactive book (doesn't every kid obsess over smart phones?!) but it doesn't compare to reading the actual book with your child. 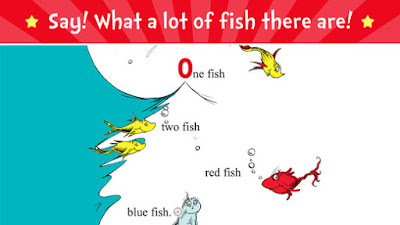 The One Fish Two Fish Read & Learn App is well-designed but we prefer the real book reading experience. I'll pass on the Read & Learn apps. Have you gone on any nature adventures this week? Disclaimer: As an Academics' Choice Advocate, I was sent these products free of charge for my honest review. All opinions are my own. Running and the journey of life have so many parallels. Life is full of uphills and downhills, depressing rainy days and perfect sunshiny ones, painful chafing and runner's highs, walls and second winds, agonizing disappointments and surprising victories. It really is a marathon! 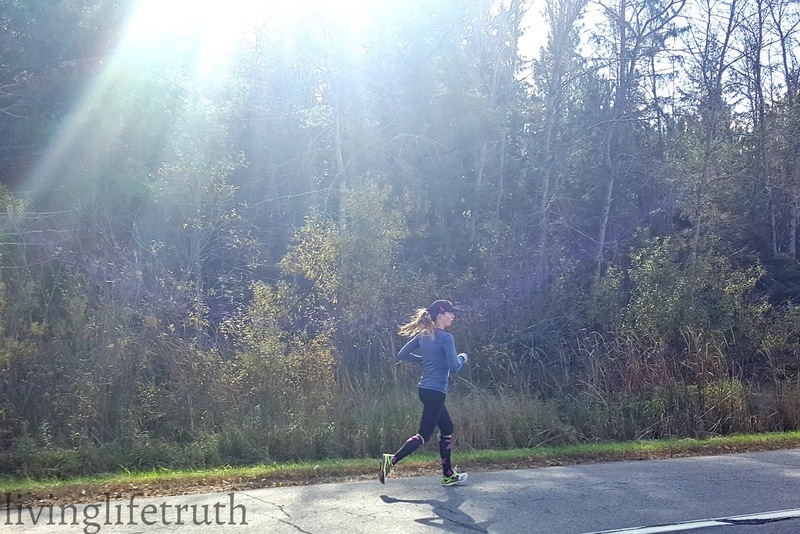 Lisa Preuette is a follower of Jesus, wife and mom of two and she shares her insight into running and faith in her book, "Embracing the Race: 40 Devotions for the Runner's Soul". An avid runner, she’s completed multiple races from 5K to full marathon. Actively involved in women’s ministry at Southeast Christian Church, she thrives on encouraging others in their faith. She resides in Taylorsville, KY.
Lisa sent me a copy of her book and it has been such an encouraging read. Even better — Embracing the Race was released TODAY! Each day in this devotional book starts with a key Scripture followed by insight into the life of a runner and the relation to our walk with Jesus Christ. One of my favorites was about embracing the hills on your run as well as in the journey of life. Hills are tough (oh yes they are!) but they are a very necessary tool to gain strength. Lisa related Coughlin's quote to the hard times in life that threaten to kill the soul and squash the spirit. 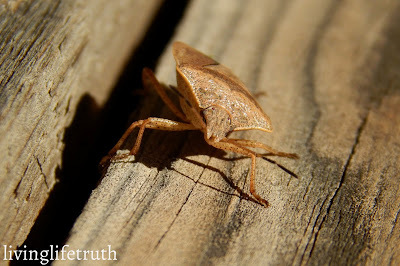 Even in the hardest times when going on another step doesn't seem possible, she shares that we can praise our Lord Jesus Christ who walks with us every step of the way. The Lord equips us with strength for the steep hills in life and, through His promise to never leave or forsake us, our faith is strengthened. 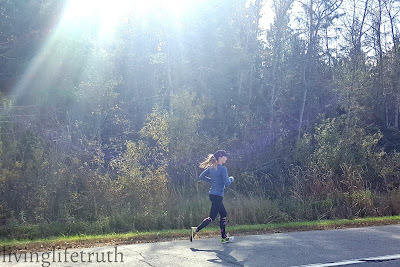 Lisa does a wonderful job of describing the walk of faith through a runner's eyes and her writing is so relatable for runners and non-runners alike. I have enjoyed her writing so much! 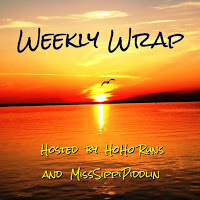 As I mentioned before, today is Embracing the Race's release date so stop by Amazon.com to check it out for yourself and read more of Lisa's writing on her blog, www.reststopforthesoul.com. TUES: (Treadmill) 4 mi, 00:34 @ 08:24 pace. Election day treadmill run while watching "The Hungry Caterpillar" on Netflix with the littles. THURS: 5.24 mi, 00:49 @ 09:24 pace. So much WIND!!! 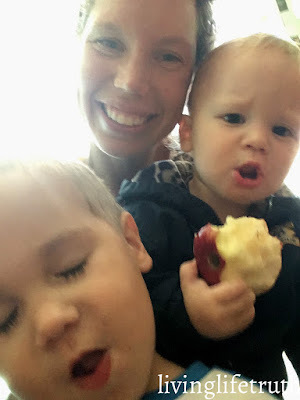 Ran to the grocery store and back with the kiddos. FRI: (Treadmill) 4 mi, 00:34 @ 08:25 pace. Some 400m intervals with 400m jog. SAT: Runner's Yoga with sidekick 2.0. What is your favorite running-related book? 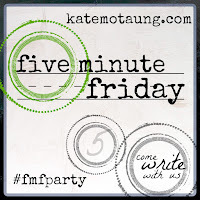 Five-Minute Friday, it's been a loooong time! (Though it's technically Sunday) I'm back for this week and the word is "Journey". Life is a journey that is meant to be enjoyed at times and endured at others. It's a process, a time of preparation and sanctification for each life season and for eternity. I feel tempted to speed up this journey at times or to skip steps but I'm trying to slow down and savor each season, each step and each day. Imagine trying to run a marathon after only one week of training. Jumping from the birth of your first child to potty training them the next day. Skipping from preschool to 12th grade Calculus. Life's journey is a very necessary process as each part is preparing for the next. Today I'm thankful for my journey and I trust this is right where God wants me to be. This book was written for me. Okay, maybe not for just me, but for all wives and mothers who are navigating this life season. 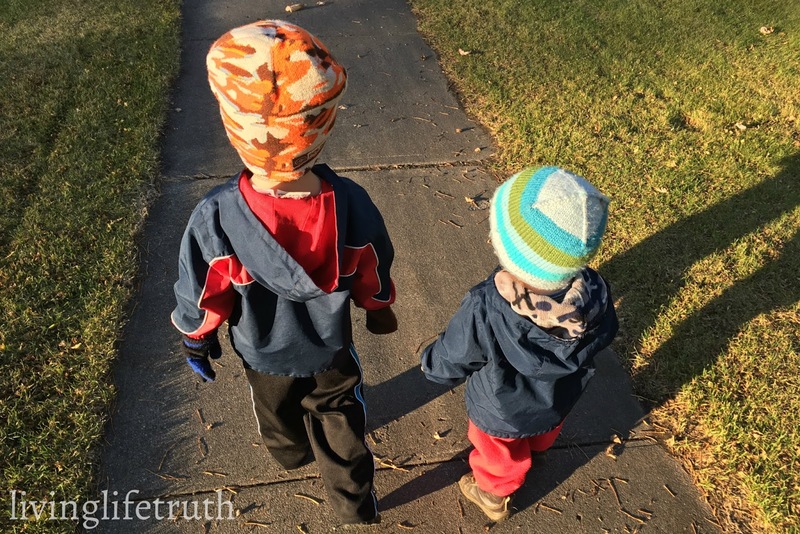 With little ones running around the house, endless tasks needing to be done, lack of sleep and life pulling in all directions, marriage will fall by the wayside if we allow it to. Love Unending is a 21-day challenge to rediscover your marriage by looking back to the very beginning. Back to how you first treated your husband and treasured each second you had together. Author Becky Thompson shares her father's secret to living in that new love every day... but I won't share it with you in this post! You will have to read this book for yourself and I assure you it is totally worth it. I enjoyed reading Thompson's Hope Unfolding and I have loved this book even more. 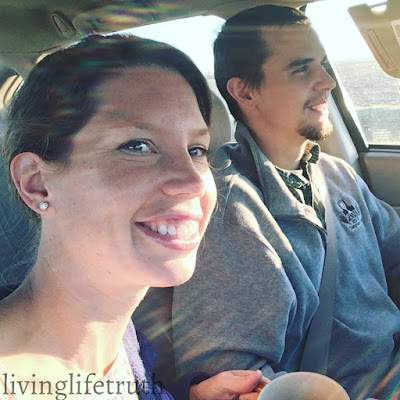 Her writing is so relatable and each daily challenge is encouraging, not condemning, and a baby step to intentionally treasuring my relationship with my husband. Becky gets it! She has walked in these young children years before and knows how to spur women on to respect our husbands, to forgive frequently and to keep that fresh love. 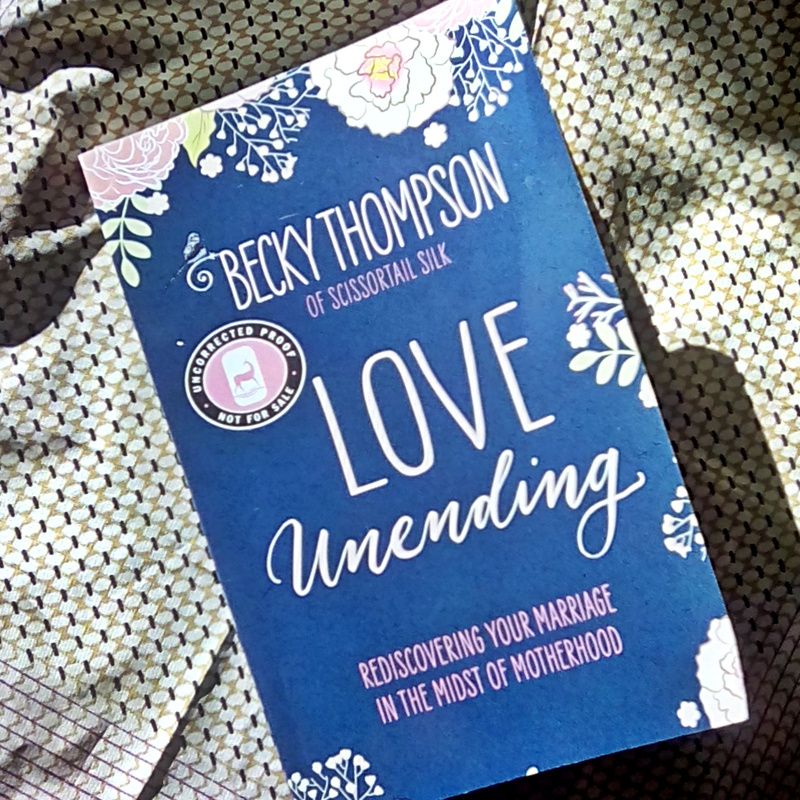 I would love for every young mom to read Love Unending. Be intentional in your marriage relationship to keep it from drowning in the dirty diapers, endless laundry piles and To-Do lists. 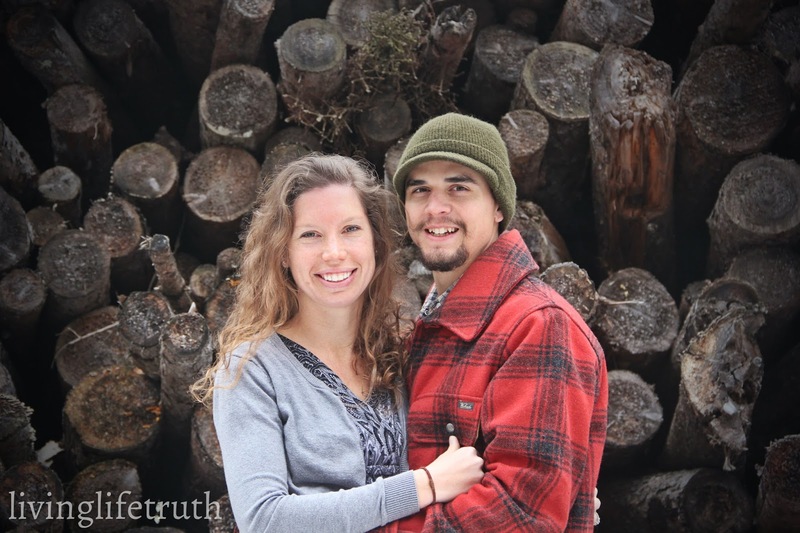 Marriage is a gift from God and I don't want to take it for granted. Sure the "honeymoon is over", as people often say, but that isn't an excuse to let your relationship die. Marriage takes work and pursuing that love unending is eternally worth it. Check out Love Unending here! 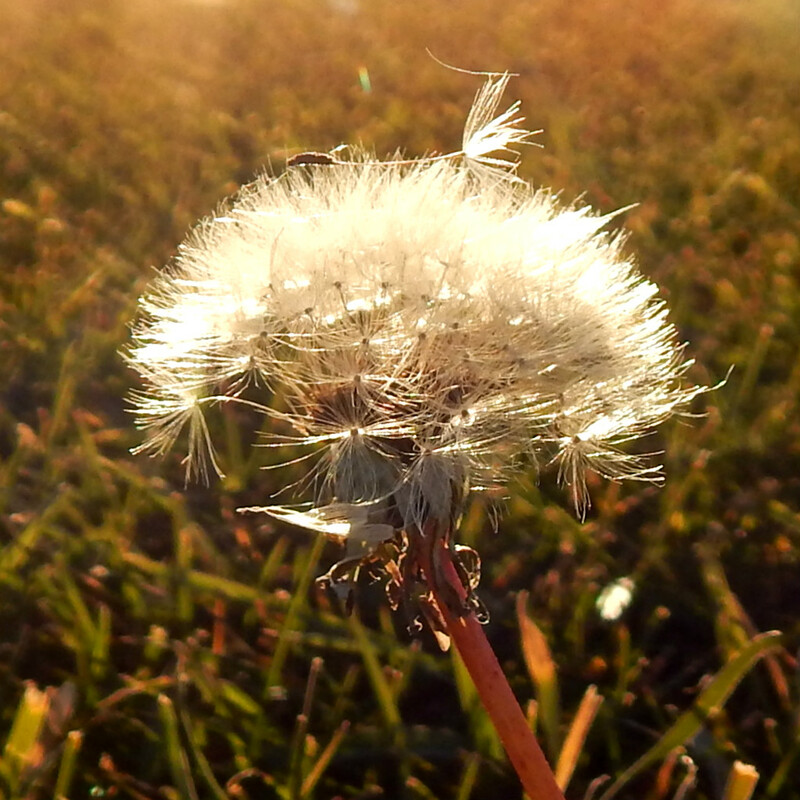 The Fall weather has been beautiful this week! Isn't it funny that everyone is in a better mood when we are outside? When I think of the preschool years (or pre-preschool in our case), Charlotte Mason's teaching on "quiet growing time" and the value of spending time outdoors always comes to mind. There is so much pressure to send kids to school sooner, do more worksheets, compare to others, learn this or that and so on. That "growing time" can easily become anything but quiet. Children love to learn. They do it all the time even when we're not intentionally "teaching" them. How wonderful would it be if that love for learning lasted a lifetime? That's my hope for them (and for myself as well!). This week we gathered leaves of all different colors on a couple walks. I'm pretty sure I enjoy this more than the kids do, as E spends most of his time looking for fighting sticks and W is simply thrilled that he can walk on his own. Along with the beautiful Fall leaves, we collected bark from the Birch tree in our yard. 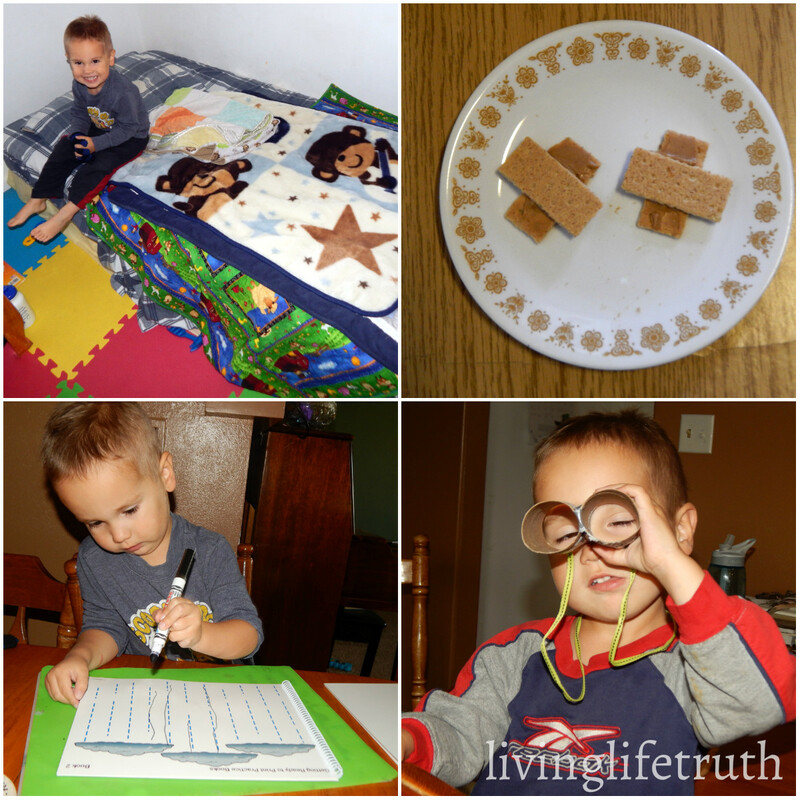 After flattening the bark in a book, E used it as his "writing paper". Oh yeah, these two little people brought home a load of candy on Monday night, too! 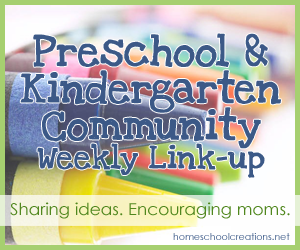 I hope you enjoyed a peek into our week!